Luxury Real Estate Marketing Essentials: Good News! Congratulations to our client, Tanya Murray, of Realty Executives of Nevada, for marketing and selling the most expensive listing to close in 2009 so far in Las Vegas! The 12,207-square-foot custom home is located at 2 Wood Creek Ct. in the exclusive Estates at Southern Highlands and closed escrow for $9.5 million. 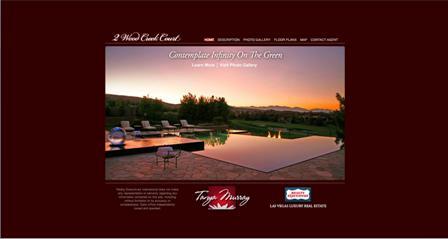 Marketing efforts included creating a custom website (www.2woodcreek.com) and dozens of high quality print and electronic marketing campaigns showcasing the home’s magnificent grounds, views and interior finishes as well as custom furnishings. The home is situated directly on the Southern Highlands Golf Course and features both expansive city and golf course views. A two-story theater. state of the art equipment, a popcorn machine, infinity pool, Baccarat crystal accessories, and Versace china added to the livable opulence this home provides. Tanya Murray has been successfully practicing real estate in Nevada for nearly 8 years and was named by In Business Magazine as one of the “Top 40 Under 40” in Las Vegas. She can be reached online at www.TanyaMurray.com.